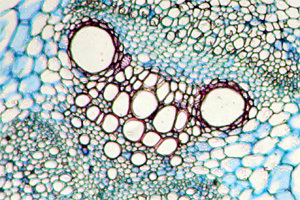 Vascular tissue of a pumpkin plant. The following section outlines some of the common beginners’ mistakes when operating a microscope. Teachers are advised to instruct their students appropriately, proper microscope technique will not only enhance the image quality but will also lengthen the life-span of the microscopes. Viewing specimens without a cover slip: The objectives are designed to be used with a cover slip. If no cover slip is used (or no water beneath the cover slip and the slide), then the focal distance will change and the quality of the image is reduced as well. Using immersion oil with a non-immersion objective: Lower image quality and dirty optics are the consequence. The oil, if not properly cleaned, will start to accumulate dust and image quality may decrease to the extent that no image is visible at all. Use an alcohol:ether mixture and lens paper to clean the objectives, but make sure that the solvent does not contact the lens too long. Otherwise the lens kit holding the lens in place may start to become soft. Using the coarse focus with higher magnification objectives: This may result in crashing the objective into the slide. Spring-loaded objectives offer a level of security here. Turning the fine focus adjustment for a long time to find a focus: This too may result in crashing the (high-power) objective into the slide. Instruct the students to restart their observation with the low power objective. Using the iris diaphragm as a means to control the amount of light: The iris diaphragm of the condenser is there to regulate resolution and contrast, but not to regulate the amount of light. At high magnifications it may be necessary to open the diaphragm to produce a brighter image, but the students should first use the dimmer to control the light. Switching the microscope on and off with the dimmer set to the highest light intensity: The lamp is heated up quickly. It is better to slowly increase the light intensity with the dimmer. Starting to observe with a high magnification objective: This is a common thing to observe. Students should start with the lower magnifications first. This allows them to select the area of interest of the specimen. Using thick, non-translucent specimens: For specimens of these types, it is better to use a stereo (binocular-) microscope. Using oil-immersion objectives without oil: This changes the focal distance of the objective and results in a low quality image. Students may then turn the focus knob to the extent of crashing the slide into the objective. Moving the microscope with the lamp switched on: This may result in a lower lamp lifetime. Move the microscope only when the lamp is cold.